Nairobi — Somaliland authorities should immediately and unconditionally release from arbitrary detention Abdirahman Ibrahim Adan, a poet known as "Abdirahman Abees," Human Rights Watch and Amnesty International said today. Abdirahman, a popular Somaliland poet and British dual citizen, has been held at the central prison in Hargeisa, the capital of Somaliland, for over a month, solely for the peaceful exercise of his right to freedom of expression. Police officers arrested him on January 12, 2019 as he was having lunch at Hargeisa's Lake Assal Hotel. The day before, he had recited a poem at the Mansoor Hotel that highlighted various human rights concerns in detention in Somaliland such as police brutality, arbitrary detention, and degrading treatment of prisoners. According to Abdirahman's lawyers, he was formally charged on February 18 under Article 269 of the Somaliland penal code for "insulting the police and the government". On February 19, they appointed a judge and set an initial hearing date of February 21, 2019. "Instead of harassing, intimidating and detaining critics, the Somaliland authorities should focus on investigating the mistreatment of detainees that Abdirahman describes in his poem. Somaliland authorities should end the crackdown on peaceful dissent and respect, protect and promote the right to freedom of expression of everyone in Somaliland," said Sarah Jackson, deputy director for East Africa, the Horn and the Great Lakes at Amnesty International. Abdirahman's lawyers said that the police did not produce an arrest warrant or any other court order allowing for his arrest. 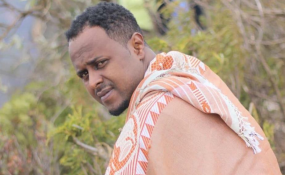 He was held at the Criminal Investigation Department's Counter-Terrorism Unit for three days, then transferred to Hargeisa Central Police Station for one night, and then on to Hargeisa Central Prison, the lawyers said. Before reciting his poem on January 11, Abdirahman told the audience that he had been detained briefly in February 2018 for being "arrogant" with police. He described his shock at the deplorable conditions in the police station and said he saw a woman whom he believed to have a mental condition in chains and four 14-year old boys accused of breaking a mirror being held with adults who had been arrested for murder and other serious offenses. Abdirahman said he had decided to write the poem because of that experience. The poem calls on the Somaliland government to reform its prisons and criminal justice systems. On January 13, the deputy head of police, Abdirahman Liban Foohle, and the police spokesperson and the head of traffic police, Colonel Feysal Hiis Elmi, confirmed the arrest and detention. In a statement, the police accused the poet of "defaming the security forces and the state." Somaliland's 2001 Constitution guarantees the right to freedom of expression and of the media in "accordance with the law." But the penal code, which came into force in 1964, includes a number of vaguely defined and overly broad criminal offences, including offending the honor and prestige of the head of state, insulting a public officer or institution, or contempt against the nation, state or flag. These can be punished by sentences of up to three years in prison. The Somaliland government has increased its clampdown on dissent since the current administration took office in December 2017. The authorities target poets, journalists and perceived critics - particularly those who speak out on alleged politically sensitive issues, including the border tensions with Puntland and unity with Somalia. In April 2018, three people - Naima Ahmed Ibrahim, a popular poet; Mohamed Kayse Mohamud, a blogger; and Boqor Osman Aw-Mohamud, a traditional elder - were convicted under vague criminal provisions for public criticism of public officials and government policies. All three later received presidential pardons. On February 10, the regional court in Hargeisa suspended the Foore newspaper for one year and fined the editor, Abdirashid Abdiwahab Ibrahim, three million Somaliland shillings (US$300) for publishing news about the building of a new presidential palace in Hargeisa. The newspaper was accused of spreading misinformation. According to the Human Rights Center, a leading human rights organization in Somaliland, the Somaliland authorities arrested 28 journalists for their work or for social media posts in 2018 alone. This points to a worrying trend of restricting the right to freedom of expression in Somaliland. "The Somaliland authorities should immediately and unconditionally release Abdirahman and allow public space for criticism, including on contentious issues such as detention conditions," said Felix Horne, senior Africa researcher at Human Rights Watch. "The ongoing detention of Abdirahman and the broader crackdown on dissent fly in the face of Somaliland's international obligations to freedom of expression."